Living for Jesus is hard work. I don't often manage it. These are my theological musings and my personal journey/struggles in applying them. "Can Or Should Christians Judge One Another?" This Bible study was written and submitted in April 2001 by: Joseph M. Willmouth, Pastor of Trinity Bible Church in Biloxi, Mississippi 39532. This contributed article is copyright protected, and the sole property of the contributing author. It may be freely copied and used provided the above credits are included. Document expiration: indefinite. Today, one of the most quoted verses that we hear banded out by people is "Judge not, that ye be judged." Therefore meaning, "who are you to judge me?" "Don't you know that you are not supposed to judge people?" Usually this is what comes out of a person's mouth when confronted about their behavior, their personal beliefs, or for what they are teaching. Is this really what the New Testament teaches, or is this just a smoke screen to cover-up unbiblical behavior or teachings? Let's look at what the New Testament teaches concerning a Christian's position when it comes to making judgments. Let's start with the most often quoted passage in Matthew 7:1-5 where is says, "1Judge not, that ye be not judged. 2For with what judgment ye judge, ye shall be judged: and with what measure ye mete, it shall be measured to you again. 3And why beholdest thou the mote that is in thy brother's eye, but considerest not the beam that is in thine own eye? 4Or how wilt thou say to thy brother, Let me pull out the mote out of thine eye; and, behold, a beam is in thine own eye? 5Thou hypocrite, first cast out the beam out of thine own eye; and then shalt thou see clearly to cast out the mote out of thy brother's eye." If we stop with the first verse, as most people do, it would seem to teach that to judge anyone is totally wrong. The problem with this is that it pulls the verse out of the context in which it was written. By the time you get to verse 5, it is clear that Jesus is talking to hypocrites (i.e., the Jewish religious leaders) who are condemning others for not living up to their standards. The context for this section along with Luke 6:39-42 is the Sermon on the Mount, in which Christ was rejecting Phariseeism as a means by which a person could attain righteousness that would make them fit to enter the kingdom of heaven. The Pharisees claimed to have the most authoritative voice in Israel in matters pertaining to Moses' law. Therefore they demanded explicit submission to their teachings (i.e., the oral traditions). Jesus Christ says this about the Pharisees in Matthew 5:20, "For I say unto you, That except your righteousness shall exceed the righteousness of the scribes and Pharisees, ye shall in no case enter into the kingdom of heaven." Christ wasn't declaring that the Scribes and Pharisees were righteous, but was pointing out that their righteousness fell short because it was based upon the legalism of their oral traditions and not God's Word. So no one could enter the kingdom of heaven by trying to live up to their standards. People do the same thing today when they go beyond what God has declared and set their own standards, and then expect others to live up to their standards. The fallacy of this is how can sinful man set higher standards than a totally holy and righteous God can? The nation of Israel and its leaders were blind to the God's truth, and Christ told them in this passage what they needed to do to remove their blindness in verse 5, "Thou hypocrite, first cast out the beam out of thine own eye; and then shalt thou see clearly to cast out the mote out of thy brother's eye." When we remove the beam of legalism from our eyes then we can begin to see what God expects of us, and then we are able to help others who are stumbling also. The point of this whole passage was a warning about judging others based upon their own standards because they would be judged according to their own standards, which they themselves could not even live up to. Jesus also reinforces this in John 7:24 where He tells the crowds not to judge according to mere appearances (their superficial understanding of Him healing a man on the Sabbath), but they were to use a righteous judgment. If this is not the case then Jesus Christ contradicted Himself in Luke 12:54-59, where he tells the people to judge for themselves what they were seeing and hearing from His ministry to see if it was right according to what was taught in the Scriptures concerning the Messiah. So it is clear from just a brief look at what Jesus taught in these few verses that He wasn't teaching that all judgment was wrong, but only when it is based upon human opinions and motives, and not God's Word. With this said, now lets turn our attention to what the Bible teaches about judging. 1. Areas that we should withhold judgment on. a. When it comes to personal convictions or preferences (non-moral issues) on which the Bible has no clear teaching then we should not judge someone who makes those choices. Romans 14:1-23 speaks about not judging another believer because of their eating preferences (vv.1-4), or how they view the significance of special days (vv.5-8). But Paul does make it clear that our opinions or convictions on these matters should not become a stumbling block to other believers, then it would become a moral issue (vv.13-23). b. We should not judge people just by their outward appearance (John 7:24; James 2:1-4). This is superficial judgment that is often based upon how someone looks or talks, and is not based upon what they are actually doing for the Lord. The problem with this type of judgment is that it usually has it roots in legalism and not Scripture. c. We should withhold judgment upon another Christian's service (1 Corinthians 4:1-5). The context of this passage is dealing with divisions in the church a Corinth because of factions and false teachers who all calming superiority over the others. As a result some were criticizing Paul's ministry because they felt that he wasn't doing what they thought that he should be doing. The problem wasn't Paul's ministry or what he was teaching, but it was the attitude of some in the church. This doesn't mean that we are not to be discerning about a ministry, but that we are not supposed to condemn others because they are not doing what we think they should be doing. We need to keep in mind that some plant and some water, but ultimately it is God who causes the growth (1 Corinthians 3:1-9). An example of this would be when we start thinking that we could preach or write better sermons than the preacher, or we think that we could do a better job than what someone else is doing in another area of ministry. Or that we think that a person isn't doing something in a way that we think it should be done. When you do things like this, you are in a sense looking at individuals more like chess pieces and not people chosen by God to do the best they can with what God has given them. d. This last area tends to build off of the other areas, and that is letting our tongues express our opinions about others (James 4:11-12). When we criticize others, we are placing ourselves in the position as judge and pronouncing judgment upon them when we may not know or understand all the details of why someone is doing what they are doing. Again, let me remind everyone that these passages are addressing non-moral issues. When it comes to sin, false teaching or ministries, the Bible clearly teaches that we are to be discerning which means we need to make an judgment based upon God's Word. 2. Areas that we should make judgments on. a. Christians are to judge disputes between members of the local body of believers so they can settle these disputes (1 Corinthians 6:1-8). This is so that the problem doesn't spill over into the non-believing world, which discredits the church's witness to the lost. b. The local church is to judge the unrepentant sins of its members, and to take the appropriate actions. Unconfessed sin needs to be publicly judged rightly and condemned (1 Corinthians 5:3-5). When we do this, it must be done according to God's Word (see Matt.18:15-20). The purpose of this judgment is not to condemn, but to restore the sinful believer into useful service (Galatians 6:1-5). If the sinful believer refuses to repent, then we are to break fellowship with them until they do repent (1 Corinthians 5:11-13; 2 Thessalonians 1:8; 3:6). Christ rebuked the church of Thyatira for not judging a woman who was a false teacher and prophetess, and who was sinning (Revelation 2:20-24). c. We are to rightly judge the doctrinal teaching of preachers and teachers by God's Word (Matthew 7:15-20; Acts 17:10-11; 1 Corinthians 14:29; Titus 1:10-16; 3:10; Hebrews 13:7; 1 John 4:1; Revelation 2:20-24). Peter and John both told the Jewish leaders to judge what they were saying to see if it was true or not according to God's Word (Acts 4:19). Paul tells the Corinthians to judge what he was saying (1 Corinthians 10:15). It does need to be pointed out that we are not to listen to accusations against our pastor/leaders unless there are at least two or three witnesses (1 Timothy 5:19-20). d. We are to rightly judge potential Elders/Pastors and Deacons to see if they measure up to the qualifications given in the Scripture (1 Timothy 3:1-13; Titus 1:5-9). The reason why many churches have the problems that they have is because they fail to obey God's Word and appoint people who are not qualified according to God's Word. This means that we have to discern or judge others by God's standards in order to be obedient to God's Word. e. We are told in 1 Thessalonians 5:14 to "admonish the unruly." In verse 15, we are told to "see to it that no one repays another with evil for evil." So it is clear that we as believers have to be discerning about other believers. This doesn't mean that we are to go around looking for every little speck or flaw, but that when we see people doing things that are clearly unbiblical then we are to speak up and say something. f. We are to examine or scrutinize ourselves to see if our faith is real (2 Corinthians 13:5-7). This testing is to see if we are truly saved and if we are doing right in the sight of God. We are also told to judge (scrutinize) ourselves before we partake of the Lord's Supper to see if our spiritual condition is correct (1 Corinthians 11:31). Conclusion. The principle reason so many Christians today think that they don't have a right to judge anyone is because they have been indoctrinated with the worldly teaching of "tolerance." To the world tolerance means that truth is subjective, and there is no absolute truth. This means no one has to right to tell someone else that they are wrong, because one person's opinion is just as good as someone else's. Therefore we hear such things as, "who are you to judge me, or to tell me if I am right or wrong?" According to some statistics (The New Tolerance, by Josh McDowell and Bob Hostetler, pages 173-174) 50% of Christian youth do not believe that an objective standard of truth exists, while 53% of the adults do not believe in absolute truth; Two-thirds of the 70% of Americans who say it is important to follow the teachings of the Bible reject moral absolutes. This is why many Christians today think that no one has the right to say anything to them, because that is judging them. When you bring this attitude into the church you have to ignore the Scriptures, because they do teach that there are absolute truths. Scriptures plainly teaches that believers are not to walk around blindly, ignoring sinful behavior or false teaching; and if we do then we are in direct conflict with clear teaching of God's Word. Christians need to take to heart the words of Peter and other apostles in Acts 5:29 when told that we are not to judge anyone, "...We ought to obey God rather than men." Christians, nor churches can afford to ignore God's Word and turn a blind eye to those who propagate the false teaching that no Christian has a right to judge another. To do so will only lead to confusion and division among the church body, and shows a contempt for God's Word. But we must also acknowledge that when it comes to judging, we need to always check our motives before we say something to another believer. If what we are doing is not based squarely upon God's Word and a love for our brother or sister in Christ, then it is best to keep our mouths shut. 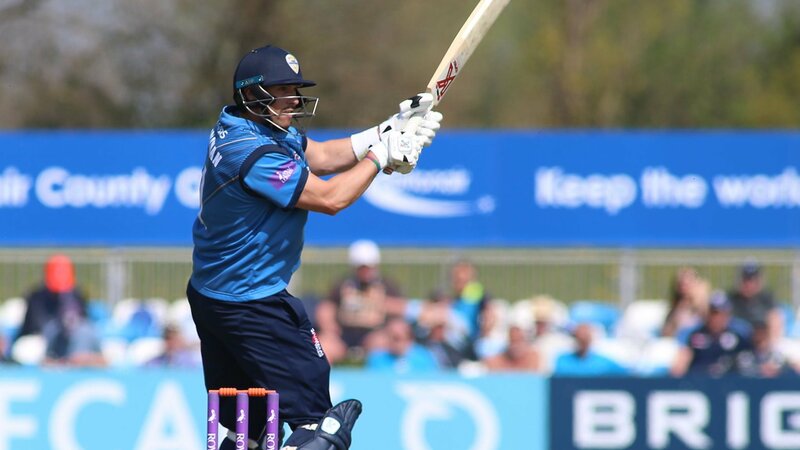 One-Day Cup: Godleman ton helps Derbyshire beat Leicestershire - Billy Godleman hits another One-Day Cup century as Derbyshire beat Leicestershire off the final ball in the One-Day Cup. What You Think Matters main feed. Is Newfrontiers abandoning it’s commitment to Male Leadership? How do you read controversial books? Why are so many people struggling with their identity? (c) 2011 Rob Mason - please include a link to this source if you republish. Thanks. Awesome Inc. theme. Powered by Blogger.